An object of desire, a love token, an alluring mystery. 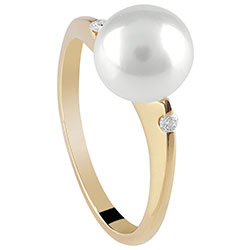 Salvini selects only the brightest freshwater pearls, in the variants white and pink, to pair with white, yellow and rose gold, which exalt their delicate nuances. A collection of jewellery dedicated to a refined woman who stands out for her elegant simplicity. Rings with pearls that cleverly combine the past with the present to offer a modern new take on the pearl, a timeless classic.